Light Switches and outlets are taken for granted by providing endless amount of light and electricity at a moments notice. With proper care, these electrical elements will serve you and your house for 20 years or better. For the most part, we do not consider these items a problem until they are broken or when failure occurs. However, recognizing conditions than can be resolved today will allow you to fix the issue on your own schedule and ensure adequate safety to you and your home. We all know that failure typically won’t occur until you really need it. So take a look at your electrical outlets and switches today, you may be surprised to find that some of them are starting to show indications of wear that will eventually result in failure. Replacement or repairing them now will ensure uninterrupted service. Light Switches: This inspection involves visiting every light switch in the house. Go through each room, one at a time. Standard Light Switches: Operate every light switch in every room. It should operate smoothly. If it is warm, makes noise, won’t stay in the on or off position or feels mushy, it should be replaced. Dimmer Switches: There are different styles of dimmer switches, they include standards/with secondary sliders, full sliders and rotary switches. Compared to standard light switches, it is not uncommon to find dimmer switches warmer than ambient. This is normal. Operate the switch through its full range. It should transition from off to 100% (on) smoothly. Some switches may have clicks or notches in the transition from 0% to 100%. If the light interrupts or flickers during transition from off to 100% the switch should be replaced. TIP: Dimmer switches and CFL (compact florescent lights) don’t mix unless the switch and bulb is rated for it. This improper switch/bulb combination may act like a bad bulb or switch. 3-way Switches: Are defined as two switches with one light circuit. Either switch on this light circuit should be able to turn the light on or off no matter the position of the other switch. 4-way Switches: Are three switches with one light circuit. Any one of the three switches should work the same as the 3-way switch and should operate the lights regardless the position of the other two switches. Electric Outlets: This inspection involves visiting every electrical outlet in the house. Electrical outlets are very durable and can last a life time, however the excessive wear and abuse can cause damage to them. Testing: Test each and every outlet to validate voltage and polarity. Purchase a low cost outlet tester much like the one pictured to the right for this inspection. They are self explanatory in their use. Generally you plug them in the outlet and they will provide a self check set of lights that will provide a go-no-go indication. TIP: Make sure you check both outlets on the receptacle as they can be wired separately. An outlet can fail a test and appear to work properly. The three most common failures are, 1) reversed polarity, 2) open ground, 3) open neutral, 4) Hot open. Reversed Polarity: Hot and neutral are terminated on the wrong connectors. The outlet may still appear to work correctly. Open Ground: The ground circuit is not complete. This usually happens when a grounded type (3 holes) outlet was used to replace a faulty 2-wire receptacle. TIP: Even though this outlet will appear to be working properly and will not cause an issue when using a lamp, this open condition can create issues with electronic devices such as computers, TV’s or stereo receivers. Open Neutral: Similar to Open ground. TIP: Even though this outlet will appear to be working properly and will not cause an issue when using a lamp, this open condition can create issues with electronic devices such as computers, TV’s or stereo receivers. Hot Open: The outlet will be dead. Receptacles: 2 prong vs. 3-prong outlets were prevalent in houses built prior to 1965 and without an adaptor, you will not be able to properly use a plug cord with 3-prongs. The NEC code changed around 1965 requiring grounded outlets be part of new construction. If your house was built around 1965 and you find 3 prong outlets or a mix of both and the wiring was not upgraded, the tests performed in item 1 will reveal those problems for you (typically open ground). Even though the receptacles may appear to work properly, ghost problems may occur. If your electrical system is based on a a 2-wire system, 2 wire outlets and adapters are still considered acceptable. However, proper grounding for today’s electronics may not be compatible and rewiring your house may be considered. Physical Damage: Inspect each outlet for physical damage. If the outlet or the face plate is damaged, they should be replaced. Warm Outlets: If the outlet feels warm to the touch, the outlet or the wire connection may be faulty. Replacing the outlet should resolve the problem. Purchase a higher quality version of the same receptacle (about 3 bucks) and used the screw down terminations. For more detail testing of this condition, see the article on Warm Outlets. Overloaded Outlet: Most residential outlets are rated for 15 Amps maximum. Installing an excessive amount of electrical devices can cause problems. TIP: In these occasions where you need more outlets from the same receptacle, use a fused power strip. The power strip will include a fused breaker on the device. If an overload occurs, it will trip and protect the wall plug and the circuit from damage. GFI (Ground Fault Interruption) Outlets: GFI outlets are found in newer (or remodeled) houses. Typically GFI outlets will be found in the kitchen, bathrooms, garage, outside outlets or areas where the homeowner may be exposed to water while using the outlet. GFI outlets look a little different and should be labeled as such and will have a self test button. The test button should disable the outlet and expose a reset light or button. Press the reset button and power should be restored. If the outlet does not disable and reset during the test, it should be replaced. In some cases, GFI outlets may be wired together and will cause multiple outlets to be disabled at the same time. TIP: These additional outlets may look like regular outlets but SHOULD be labeled as GFI, but don’t be surprised if they are not. Additionally the controlling GFI outlet may or may not be located in the same room. Inspect and test all outlet using an outlet tester. Replace or repair the outlets and switches as necessary. Read my article on Warm Outlets. The electrical service panel would be considered the heart of the electrical system. A properly sized, correctly wired panel will serve the electrical needs of the home for many years. Proper care and inspection will reduce the potential of system level problems and failures. If you have many of today’s modern conveniences such as a dishwasher, clothes washer, dryer, electric heat and air-conditioning, your service is likely 100 Amps or greater. If your house has anything smaller than 100 Amps, upgrading your service to 150 Amps or greater is highly recommended. If you have very few of the items mentioned, the inspection covered in this section may or may not reveal immediate problems associated with a small panel, but as you add more electrical devices, you will start to see issues that are discussed in this topic. Look at the table below to help determine what level of electrical service panel you may have. Generally speaking, service panels are not well marked to provide you an exact rating number, but the fewer positions the lower the rating. More positions typically equates to larger service. This is all based on the assumption that the panel is supplied with large enough cables in the first place. If you live in an older house, don’t be surprised if you have add-on panels that are used to provide additional capacity, if they are installed correctly there should not be any problems. If you question the cable sizes, have an electrician look at the panel for greater clarity. With our increased dependency on electricity, the minimum acceptable size of AC service panels has slowly increased over the years. If your house is in category A or B with the original AC service panel, upgrading to a 150 Amps or greater can be a wise decision, as adding additional circuits will be problematic. In fact, some insurance companies may not issue or renew a policy because of the fire risk associated with the smaller panels. With relative ease, and a tool or two, the homeowner can inspect the electrical service panel to identify conditions that may warrant further investigation or repair. Additionally, if you would like to analyze your AC requirements, send me an email and I can forward you an spreadsheet to calculate your AC demand. This will provide you a general reference of demand vs. capacity. Visual Inspection: This level of inspection is performed with no more than the door open. No screwdrivers or tools should be required to expose the face of the panel. There should not be any exposed wires at this point. Your service panel should (generally) resemble this picture (for a panel newer than 1960). Look at the general condition of the panel. The door should open and close without difficulty or obstruction. The panel should fit snug to the adjacent wall. No gaping holes around the panel face around the Sheetrock or wall covering. If you find conduit or Jacketed Metal Conduit (JMC) leaving the sides of the panel, this is okay assuming the electrical conductors are not exposed. With the door open, look for missing knockout where breakers may have been removed. TIP: Home centers have plastic filler plugs to cover these holes. No standing water, corrosion or signs of water in the panel is acceptable. Call an electrician for resolution. Look at all the breakers for deformation, if they look melted or are no longer holding their original shape, they should be replaced. This can also be an indication the breaker has or is exceeding its limitation. Heat and your AC Service Panel: Heat generated by the electrical service panel is an indication of potential problems that may result in an interruption of service. Heat can be recognized in a couple of different ways. 1) by touch or, 2) or digital infrared thermometer. If you don’t own a digital thermometer, they can be purchased for a reasonable price ($15 to $100) over the Internet or discount tool supply. The digital thermometer will be referenced throughout HomeownerBOB and its a great addition to your tool box. You will find lots of uses for it. Before you look for heat issues, try to answer these questions. Have you noticed that you regularly trip breakers? Does it occur at a certain time of the day? Does it occur when you use specific appliances such as a vacuum cleaner or hair dryer? Is it the same breaker(s) that have to be regularly reset? If you answer yes to any of these questions, it’s a good decision to replace the breaker(s) now. All breakers have a service life and can deteriorate over time due to frequent tripping or heavy loads. Large commercial breakers can be tested and repaired, but it is more economically feasible to replace residential breakers if there is any question of their reliability. Furthermore, this will further the isolation process of the breaker if it continues to trip. Test by Touch: Without a digital thermometer, you can place a finger on the face of the plastic breakers. TIP Look for temperature differential. If you find an individual breaker noticeably warm, and it has been tripping, you may have an issue, so have the breaker changed out. If you already changed it out and it is still warm, the load on the circuit is probably high. If the breaker has not been tripping, no further action is required. Just make a note in your inspection journal and look for a change from one inspection to the next. Test by Infrared Thermometer: TIP: Look for temperature differential. If you find 25% in temperature difference between the hottest breaker and the coolest, and it is not tripping, log it in your home inspection journal. Tripping Breakers: If the breaker has started tripping, replace it first, then try the following trick to resolve the issue if it continued to trip after replacement. TRICK: Identify everything plugged into this circuit and try moving some appliances to other circuits to de-load this one. If you can live with this change, you have solved the issue, no further action is required. If it’s not a convenient arrangement, you may need to hire an electrician to re-associate some outlets to different circuits. This can get expensive, but it will take an on-site analysis to figure it out. Regardless, re-associating the circuit should solve the problem. Testing and Exercising Circuit Breakers:Some professionals recommend circuit breaker testing by switching breakers on/off 5 consecutive times once per year. HomeownerBOB considers this optional. If the service panel is over 10 years old and breakers were never exercised for test, cycling them may actually cause some deterioration. TIP: Determine the brand and style of the breakers and buy a couple of the most common sizes (15, 20’s and 30’s are the most popular) and keep them for an emergency. If you choose to exercise the circuit breakers in the future, you will have ready access to a replacements. If the house is fairly new, exercise them if you wish. Service Panel and Breaker Caution: If your service panel is a Federal Pacific brand, some municipalities require them to be replaced. FPE Panel Controversy. GFCI Circuit Breakers:These special breakers will look different than a standard breaker as it includes a test and reset button, just like a GFI (ground fault interruption)outlet. In newer houses the electrician may wire an entire bathroom or all the kitchen circuits as GFCI in lieu of installing individual GFI outlets. You may also use an outlet tester with a GFI testing feature to trip the breaker. Either way will work but HomeownerBOB prefers to test at the outlet as this allows you to associate the outlets with the breaker. See Outlets and Switches. AFCI Circuit Breakers: AFCI breakers may look like a GFCI, both will be properly labeled to identify the difference. Arc Fault Circuit Interruption breakers are designed to prevent fires based on an arc flash that could occur in an electrical appliance. Read their full description in US Gov. AFCI doc for more information. Since 2002, the NEC has required these breakers be used with all bedroom circuits. TIP: These breakers can be quite sensitive and may trip for no apparent reason. If your inspection finds no fault, the breaker has been replaced and it continues to trip, you may consider having an electrician evaluate the circuit. Even though HomeownerBOB cannot recommend the removal and replacement of this breaker with nothing other than the same breaker, there have been cases where replacement with a traditional standard breaker has solved the problem without issue. Replacing Breakers: There are many links on how to change out a circuit breaker. Here is just one. Replace a circuit breaker. If you are replacing your own breakers, they should ALWAYS be replaced with a like-for-like size and rating of the breaker being removed. NEVER up-size a breaker because it continues to trip. If you replaced the breaker because it was hot and it is still hot or it continues to trip. Make a note in your inspection journal. If it starts to trip over the year, follow the testing isolation method described above. The NEC (National Electric Code) allows for residential grade breakers to supply up to 80% of their rating. So in other words, if you have a 20 Amp breaker, the actual measured load should not exceed 16 Amps (1920 Watts) at any one time. Electrical Inspections may be a bit scary for the novice; it will be up to you to determine if the inspection is within your abilities. All inspections will be non-intrusive. If you have ANY doubts, don’t do it, call a professional. As a safety precaution, never touch any live exposed wires with your hands or any metal objects. Never stand in water or have wet hands when making inspections. All inspections identified by HomeownerBOB can be performed visually. As you can see by the chart, it doesnt take much to cause damage to the human body. To put it in perspective, a blow dryer used to dry hair uses somewhere between 900 and 1500 watts of power. Converted to Amps puts it off the chart at approximately 7 to 13 amps. Be careful and always err on side of safety. The mast/conduit will typically penetrate the roof and attach to a meter base. Depending on the area, the meter base is usually serviced and maintained by the local electric utility. At the meter base, there may be another conduit that feeds into the electrical service panel located here outside the building. It can be different from one utility to the next but typically they will maintain items one and six of the items depicted on the sketch. The homeowner is normally responsible for everything else. Hire a professional licensed electrician to perform any work on these items. Inspect for physical integrity. If there is any physical damage noted that would allow water or varmints inside the enclosure, notify your electric utility. At the house, the service cable will attach to a metal mast and enter a conduit through the weather-head. This conduit will serve a meter base. Inspect the mast and conduit to ensure it is mounted solidly, not pulled away from the house or overly distorted. A distorted mast is usually the result of undue stress on the service drop that may have occurred due to fallen tree limbs or debris that fell on the service cable. The masts are designed to endure quite a bit of stress and strain so it was probably a significant event to pull or bend the mast before the line was snapped (if at all). This condition needs to be corrected as this could pinch or nick the conductors in the conduit. Additionally, this distorted mast can allow moisture or varmints into the house creating more issues. Consult a professional electrician regarding repair or replacement. Ensure Mast is secure and not pulled out of line. All roof attachments are secure and not causing leaks in the roof. Inspect for cracks or openings in the conduit that may be allowing water into the meter base. During an extreme weather condition where the loss of electricity is widespread, individual service lines are consider lower priority than lines serving a community or neighborhood. For this reason, your home may be without services for an extended period of time if your only problem is the service entrance cable. Keeping you service cables free from tree limbs and obstructions will reduce your risk. On the outside of the house, look for the location the electrical service arrives at the house. If you have a large black cable originating from a nearby utility pole, your service is considered aerial in lieu of underground. If you have underground service no routine or inspection is required. For aerial service, typically the utility pole is within 20 to 50 feet from the house. Visually follow the path of the cable to the house. Look for a clean unobstructed path in which the cable travels to get to the house. If there are tree limbs or other items pushing the cable from its natural path to the house, this condition should be addressed. If there has been limbs rubbing the cable, use binoculars to inspect cable sheath to make sure it is still intact. If trimming is required; a minimum of 18″ to 24″ area of free space should encircle the cable. If tree trimming this area has never been performed, this could be quite involved, but after you perform it the first time, yearly inspections and pruning will be simplified. DO NOT TOUCH THE CABLE WITH ANY DEVICE THAT COULD CONDUCT ELECTRICITY. Never use a metal object to move the cable. If you do not have appropriate trimming tools, consider hiring a professional tree trimmer. If you choose to perform the work yourself, only perform the work on a clear dry day. If there has ever been any large limbs fall on the service line, ensure the service line is still a minimum of 10 feet above the ground at its lowest point. If the service wire (drop) is too low, there is usually a reason for it as previously fallen tree limbs may have caused the damage. A similar inspection of telephone and TV cable (CATV) should be performed as well. Different from the electrical service provider, the cable and telephone suppliers will trim the trees around their service lines between the house and the service poles, but it may be difficult to get them to perform this work just because the foliage is heavy. Typically, they only perform the function if there is degradation in service or they are on site for another reason. In other words, you can wait till it breaks and call them out to fix the problem or you can trim it yourself if the foliage around the lines need trimming. Normally there is no dangerous voltage or high current associated with the CATV or telephone line, but follow the same precautions as with the electrical service. 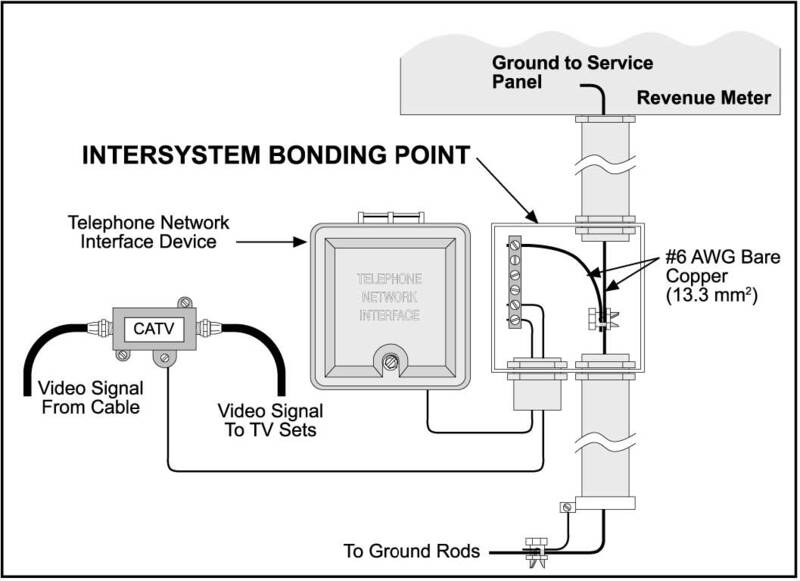 Additionally, both the CATV and telephone lines should retain a space cushion of approximately 12″ to 18″ below the electrical service drop in its parallel path to the house. It’s okay for the CATV and telephone lines to touch each other but not the electrical line. Visually inspect the electrical service drop for cuts, chips, flakes or bare spots. Trim trees and shrubs away from the line. Ensure the electrical line is at least 10′ high at its lowest point. Repeat inspection and correction process for the CATV and telephone service drops. Contact the appropriate utility (or electrician) if the the service drop(s) are in need of replacement.